But life happens. Sometimes you’re stuck in the office on a tight deadline; other times you’re just getting home from barre class, or you couldn’t score a reservation until late. 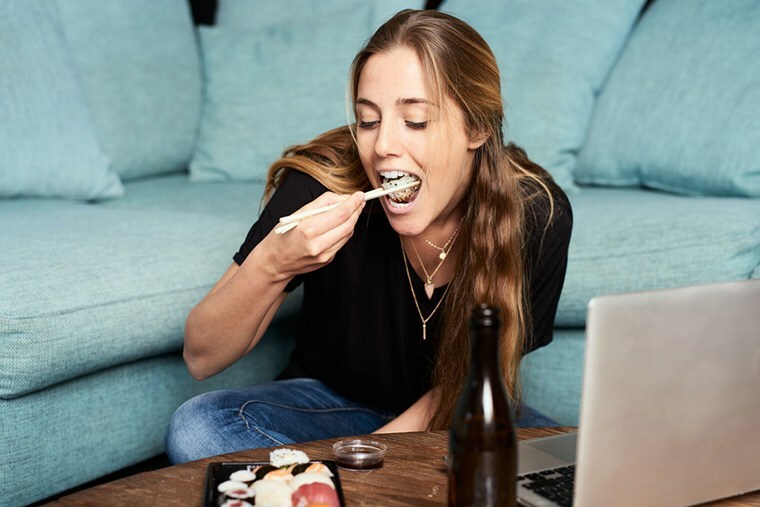 So we asked nutrition guru Ashley Koff, RD, to share her top tips on what—and how—to eat on those occasions when you’re just sitting down to nosh as Scandal comes on. You don’t necessarily know ahead of time that you’re going to be stuck in the office late, but you can always be prepared for the possibility by making what Koff calls “nutritional pit stops” throughout the day. The thinking? If you’re not ravenous by the time you finally sit down to eat, you’ll be less likely to just mindlessly wolf down whatever’s in your fridge. And it’s just an all-around good way to keep your energy (and blood sugar) up. Aim for three smallish meals between noon and 7 p.m., Koff says. They should each have a good balance of carbohydrates, protein, healthy fats, and non-starchy vegetables. That might mean some sushi around noon, a small salad a couple of hours later, and then a banana with peanut butter around 7 p.m. That way, your bigger 9 p.m. meal doesn’t turn into a Thanksgiving-style chow fest. Salads have their time and place, but late-night dining isn’t one of them. “I’m a huge fan of a big, raw salad, but it’s not the best idea to eat it after 9 p.m.,” says Koff. “It takes a good amount of work for your body to digest, and while it’s good to get your fiber in, it’s better to get it throughout the day instead of all at once at the end.” Why? Raw veggies can leave you feeling bloated and gassy—not exactly ideal when you’re trying to drift off to sleep. If you know you like something sweet with your dinner, Koff says you don’t have to give it up. (Yippee!) Instead, just make it one of your pre-dinner mini-meals. Whether it’s a scoop of nice cream or some cacao with almond butter, you’ll satisfy your sweet tooth and get a bit of energy to power you through those last few hours before dinner. Plus, you won’t be eating sugar right before bed, which can definitely interfere with your beauty rest. Koff says loading up on magnesium before you hit the hay is great because it helps turn down your fight-or-flight response, a state many people who are prone to stress are trapped in. And because the mineral is involved in so many biochemical reactions, it really helps the body repair itself overnight and prep for the next day. You could get your magnesium fix with relaxing bath salts or a cream (Koff recommends these instead of magnesium oil), but another option is maximizing your late-night meal’s magnesium levels with foods like almonds, cashews, hemp seeds, and organic soy milk. The goal is to wake up feeling refreshed, not run down—no matter how late you were noshing. To help you speed up the post-work dinner process, bookmark this list of meals that can be made in 15-minutes or less. For late-night snacks, these foods will help you sleep.